This is one of the better photos I've taken out of an airplane. Our Delta flight to Atlanta yesterday morning circled toward the south over Point Loma, then made a nice cut right across central San Diego. 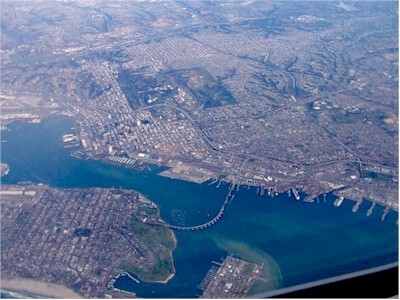 This show shows the city from the boxy profile Naval Amphibious Base on Coronado Island all the way north to Qualcomm Stadium, a little while blur near the upper right corner. I like the color shading in the bay. The Hotel Del Coronado is also visible, at the right side of the beach in the lower left. The green area in the middle is Balboa Park.